This lesson shows you the concepts that you should know about a line that is parallel to the x-axis or y-axis of the coordinate plane. Also, we will see some examples on determining its equation. In this lesson, we will learn about equi. triangle. A triangle is an equi. 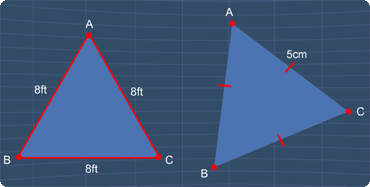 triangle, when all the sides of the triangle, have the same length. Now, to demonstrate this, let's move vertex 'B' to the right. Here, we can see that when all the 3 sides have the same length, we get an equi. triangle. 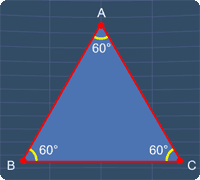 Also, it is important to note that, each of its internal angles is equal to 60 degrees. Is this an equi. triangle? 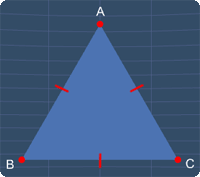 Since this triangle has 3 sides of equal length, this is an equi. triangle. We can see that, all these angles are 60 degrees. This means that, these 3 sides must have the same length. Hence, this is an equi. triangle. Last example, now, only these 2 sides have the same length. Therefore, this is not an equi. triangle. You can start by going through the series of questions on equilateral triangles or pick your choice of question below.